When my friend and I went to see Take That in concert last November, we stayed at the Parkroyal Parramatta. As we walked to the train station and back again, I had the feeling this is an area I would like to explore some more, and secretly in my mind I was already planning to bring The Other Half back here for a stay sometime. There are so many food options nearby, there is Westfield Parramatta, there is a quick train ride into Sydney if we want to travel there but the carparking is far cheaper in Parramatta (eg $20 overnight VS $50-60 overnight) and most importantly they have a Gelato Messina very close by. 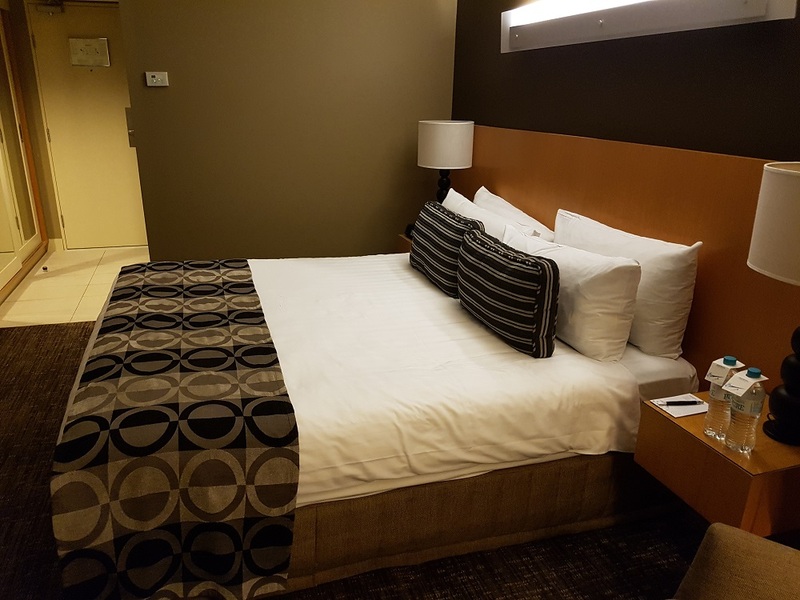 I signed up for the Discovery rewards program when I made the booking at the Parkroyal, and when we last stayed overnight in Canberra I chose one of their partner hotels. Just by signing up you get some basic benefits but the best one in my opinion is the emails they send you with special offers. 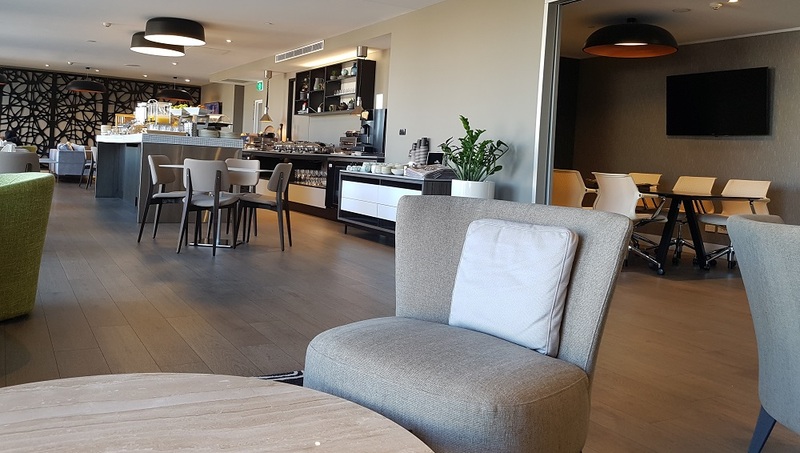 First they told us they would upgrade us to the Club level, which includes access to their club room where you have all day treats, canapes and drinks in the evening, and executive breakfast in the morning. This is normally around $250-280. Then they told us we could have breakfast in Table 30 for free – which we paid for on our first visit and it was a really great breakfast, one of the best I’ve had in a while. The price was just $155 for everything, which we felt was super reasonable. So the booking was made a couple of months ago, and finally it was time to go. I’ve been trying to visit the Sydney Harbour Pylon and the “new” food court at Gateway since.. well. 2016. My plans have never worked out thanks to other people putting the kibosh on them. Not this time, blog friends. This time I will go! The photo above is at Parramatta train station waiting for our train into Sydney. The Other Half finally got an Opal card on the way here, so now we can both navigate Sydney Transport easily. On arrival at Circular Quay, we discovered that the Bastille Festival and school holidays had the place absolutely packed. I have never seen so many people here before. You can’t see it very well in my photo sadly, but this post from Sydney Shop Girl who was also here on the same day might give you a better idea of the crowds. We headed straight to Gateway to check out the food offerings. There are a lot of things to choose here including Gelato Messina but I had that planned for dessert this evening, so we opted for The Burger Project – a Neil Perry creation which serves delicious burgers, shakes, fries, and you can even get your burger in a bowl and avoid the carbs of a bun if you so desire. Neil Perry is a food genius and quite involved with in flight catering for Qantas. The best salad dressing I ever ate was served on a flight with his name on it. 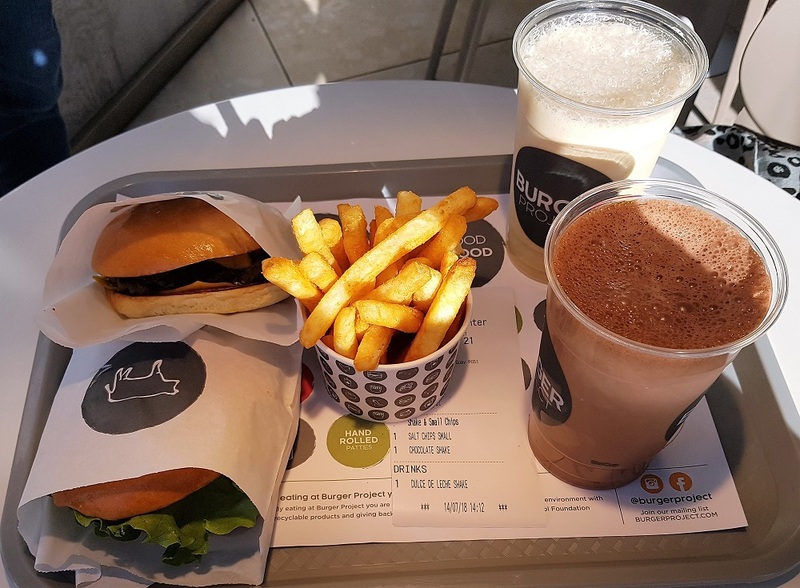 The food at the Burger Project is excellent but my heart belongs to the Salted Caramel shake which really brings the salt. We did not make it here until just after 2pm and we had places to be, so we ate quickly and headed off into the Circular Quay crowds towards the Bridge. The Rocks is an area I am very unfamiliar with but it somehow feels burned into my DNA. While The Other Half had no idea where we were going, my inner compass led us to the right places while passing some of the most interesting places. 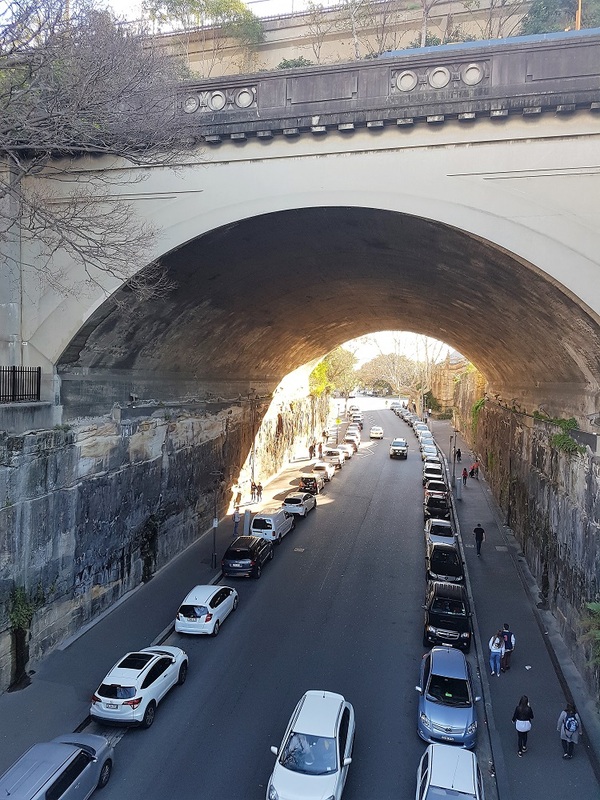 There is a sense of enormous history here, teamed with an impression of just how small we are in the company of giants like the Sydney Harbour Bridge. There are also many levels – here we are standing on a bridge looking at a lower level of road with a bridge above it and then a bridge above that too. Our destination was the Pylon Lookout which is a MUCH cheaper option than Bridge Climb – $30 for the two of us vs $636!!! You can see the engraved ceremonial scissors used to open the bridge, which are set with opals. You can click on this photo for a larger view. This is a momentary stop in the 200 stairs one will climb to get to the top of the pylon. Sadly there is no lift option, it is stairs or nothing here. But there is a good reason to climb them all.. This amazing view. What a gorgeous day in the middle of winter. Sure, I was wearing many many layers plus a beanie, but it was worth it. 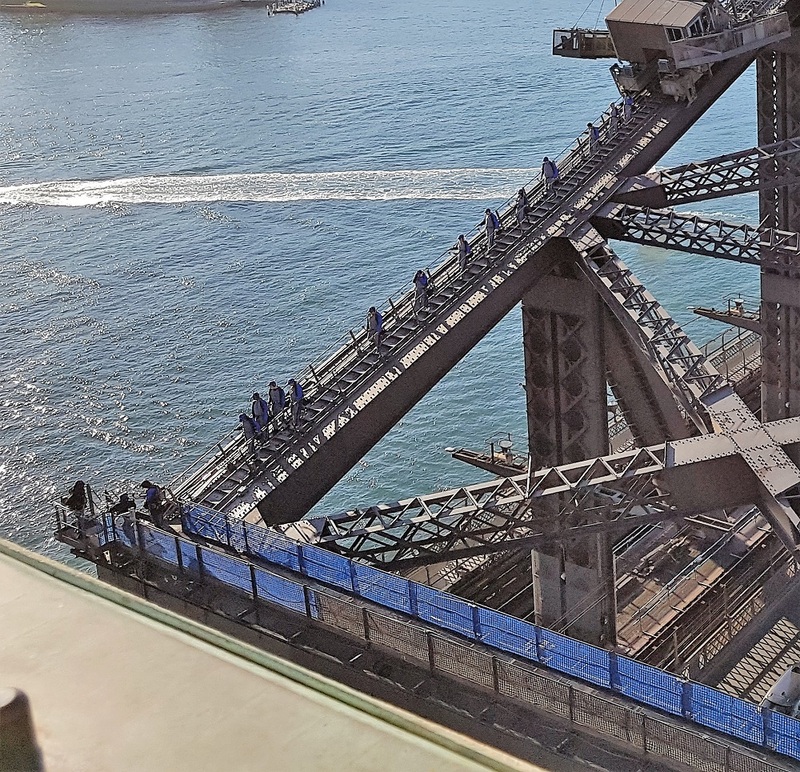 Here are some folks completing their expensive BridgeClimb, wearing the special outfits, without their cameras. That is another advantage to the Pylon – you can wear what you like and take your camera with you, and stay there for as long as you like taking as many photos as you like. We discovered that cats used to live up here. 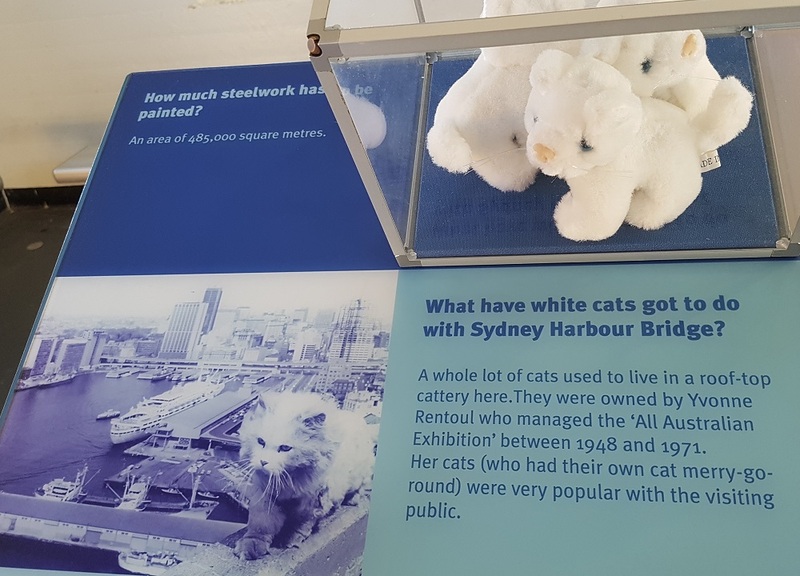 This photo was quite terrifying but a google shows me even more scary cats on the bridge photos. 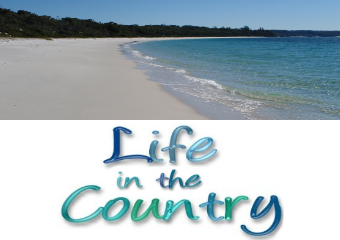 Next Monday – a quick stop in The Rocks, back to the hotel, Gelato Messina, and a day at Westfield Parramatta. You have reminded me what a long time it has been since I went to Sydney. One of my brothers and his wife just did the Bridge climb. They loved it – but your option looks much better to me. Though I am not certain my legs/body would make it. There are plenty of places to sit and take a rest, Elephant’s Child. :) We took our time and enjoyed the stops on the way up with things to look at.. then we stayed at the top for a while enjoying the view. It was cold but we could go back inside to warm up if necessary. I’d like to do it again on a hot summer day. I’m a little puzzled as we have been up the pylons and there was a token fee of a couple of dollars and only a view at the top, certainly no exhibition or museum like place. Maybe it was a different pylon. When I think more carefully, it was a long time ago. Thank you for the Pylon Lookout idea! Sounds like my kind of thing seeing as there’s time to safely take photos! 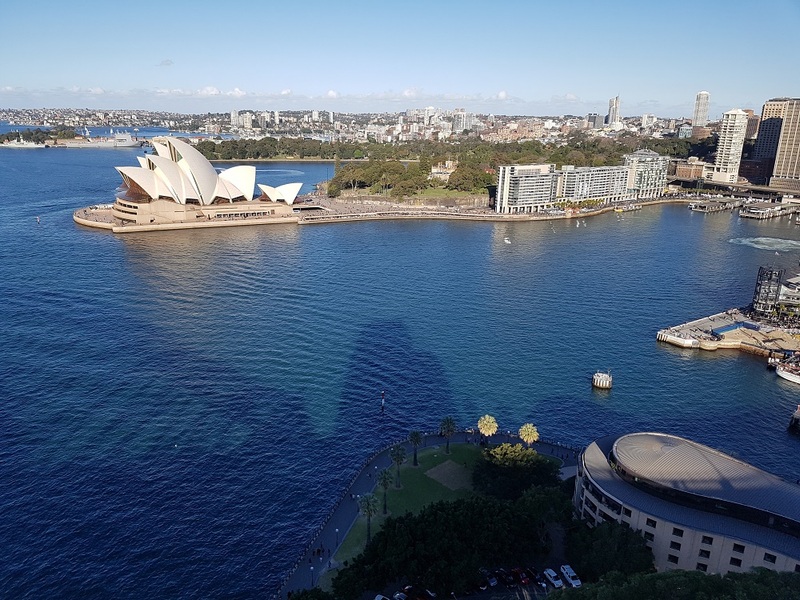 Glad Sydney was turning on the weather for your stay and thanks also for the mention! Parramatta was my old stomping grounds in high school! Used to spend my weekends at the Westfields. Ahh, memories! Nice photos of Australia. David wants to visit Sydney and take the bus to the animal sanctuary so he can pet a koala bear. Not sure we will ever make the trip.